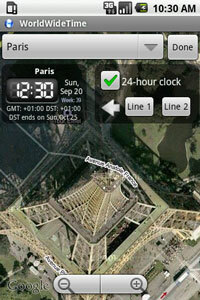 WorldWideTime is an application that displays time in cities all around the world with widgets. 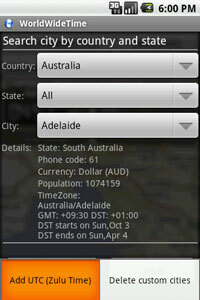 It can display date, week number and extra info such as country, state, currency, phone code, population, area in square km, country capital, GMT offset, DST start/end date and time zone. 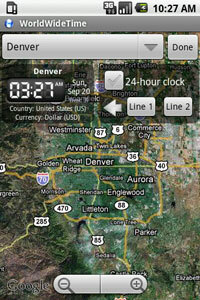 12-hour and 24-hour clock setup are available. Map with satellite view can be displayed for each city. WorldWideTime helps when you travel or when you make business abroad by providing local time and useful information about cities. Local time for 72 cities in 42 countries (Free version). 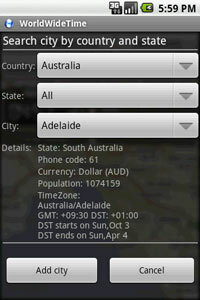 Local time for more than 2200 cities in 234 countries (Pro version) . DST start and end dates. Country area in square km. Map with optional satellite view. 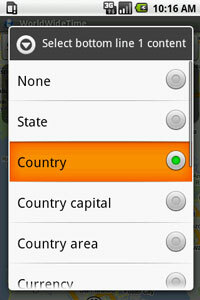 Custom cities support (Pro version) . Zulu Time (Pro version) . or upon activation key request (Menu->Options->Advanced->Activation). - Last settings saving added. - Slow display under Droid fixed. - Android 2.2, 2.3 and 3.0 support. - Payment alternative to Market added. - Refresh service improved with repeating alarm. - Refresh service backup added every 30 minutes. - Debug mode added on "back" button long press in About section. - Refresh service improved with RTC_WAKEUP Alarm. - Refresh service kill/restart behavior improved. 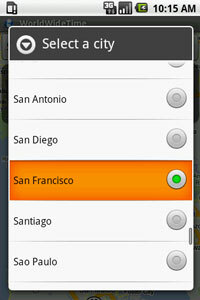 - Custom cities support added for Pro version. 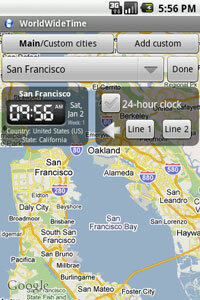 - Zulu Time support added for Pro version. - Contact support button added. - Midnight/Noon 00:00 bug fixed. Long press on home screen. Select "Widget" from popup menu. Optionally, setup the 24-hour clock. 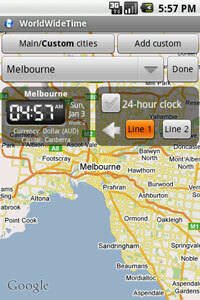 Optionally, select extra info (currency, state, GMT, DST ...) displayed with Line1 and Line2 buttons. 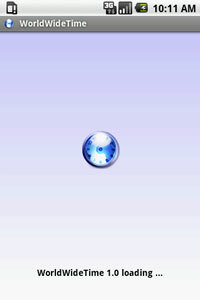 Click "Done" button and the widget will be added to home screen. How to remove a widget? Long press on the widget then drag and drop it to the trash. How to use update a widget? Select the widget and press on top-right arrow or date.